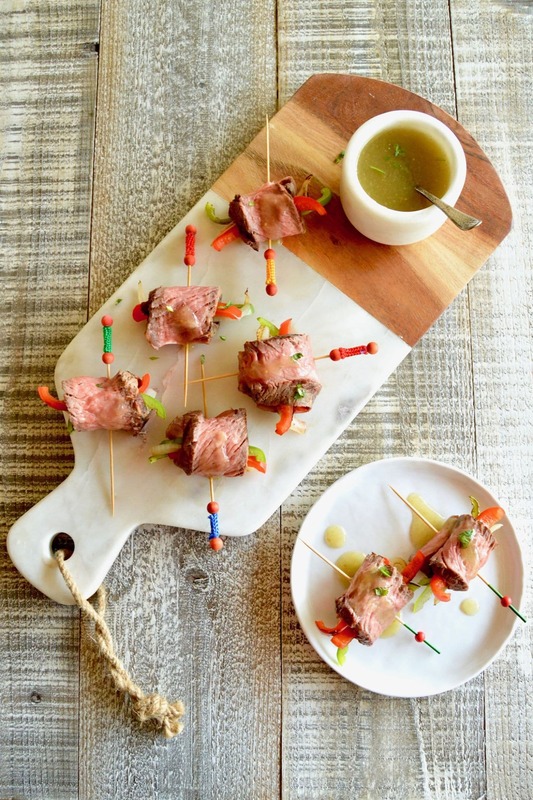 Easy Fajita Bite Appetizers are made with tender grilled steak, with softened peppers and onions all rolled into a bite sized treat. Served with a simple salsa for maximum burst of flavor ready in less than 30 minutes for easy entertaining. Easy Fajita Bite Appetizers are a simple appetizer that you can make for any occasion, whether it be an appetizer for last minute company or a light dinner on hot summer nights. I made these last weekend when we had some company staying with us. We had grilled steak the night before and had a big juicy rib-eye left over sitting in the fridge. (I know, how did that happen… we had someone have to leave unexpectedly.). We’d been touring the sites of Los Angeles (Hollywood Sign, Hollywood Walk of Fame and the Getty Museum) and we got home late in the day, hot, tired and hungry for something ASAP. While I was making these I sipped on the beer Estrella Jalisco that Im proud to be working with to bring you this post. 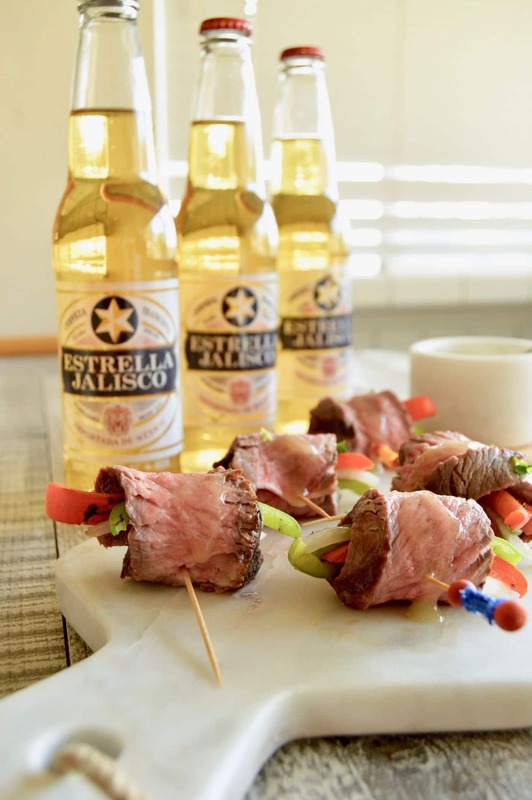 Estrella Jalisco has been around for a hundred years , but they are now releasing it for sale in the U.S. It’s a lighter tasting, very drinkable beer that works perfectly on those hot summer days. It’s refreshing but not so heavy that it fills you up. 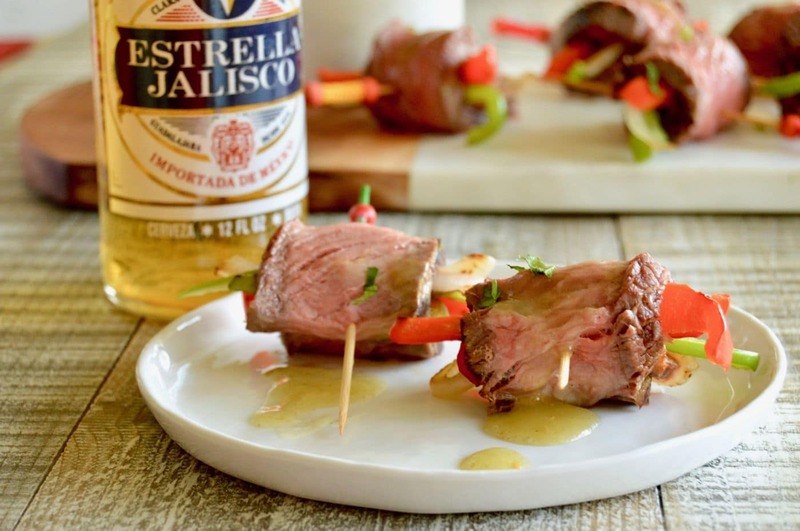 Check out their website to see where you can find Estrella Jalisco in your area. The Easy Fajita Bite appetizers were simple to make, they came together in 15 minutes using the leftover steak which included a little stove time to soften the peppers and onions like they come when you get fajitas at your favorite Mexican restaurant. I really liked the steak leaning on the room temperature side probably because it was so warm being the middle of summer. PARTY TRAY IN NO TIME FOR LAST MINUTE ENTERTAINING! Looking for other summer appetizers or lighter foods for for a last minute hot weather get together? 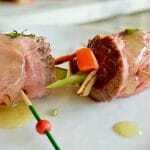 I used steak for these, but you could use a pork tenderloin or shrimp for these. The pork would be made the same just adjust the cooking time. For the Shrimp you could just cut the peppers and onions a little wider and skewer them with the toothpick to serve. I used steak leftovers, but you could easily make this when you want to serve it. 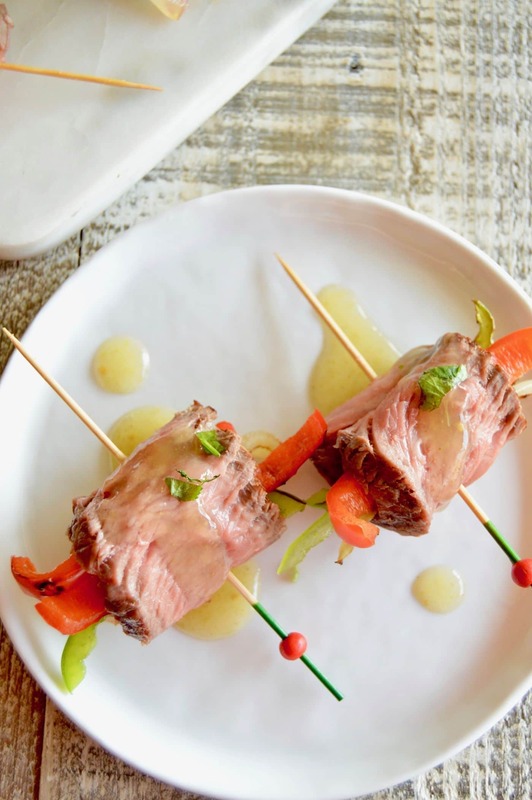 You will just need to allow extra time for the steak to rest before cutting so the juices don’t all drain away or worse dribble down while you are eating them. You can make these the night before and have them all assembled for when your guests arrive (or you are hungry the next day for lunch.). They are light and east to eat when served cold in the hot summer weather. Pull your precooked steak out of the fridge and allow to rest for 15 minutes. Cut against the grain for maximum tenderness about 1/4" thick. Thick enough you can't see through the meat, but thin enough it rolls easily. Heat a skillet to high. Add peppers and onions and stir and watch continuously. You are just softening them, not cooking completely. You want them to still be able to have a slight bite to them. (Think al dente pasta) It takes about 5 minutes to soften them. Take one piece of steak, place a couple of each pepper and a few onion strips and roll them. Secure with a toothpick. Repeat until all meat is used up. Serve along side your favorite salsa for a dipping sauce. I love this idea for easy summer entertaining! Steak fajitas are one of my favorite things this time of year, but a little messy to serve! Making up a platter of these to serve al fresco sounds like the perfect bite on a warm night. I’m definitely going to check out Estrella Jalisco, too! Sounds right up my alley. These are party perfect. Pour me a glass of wine (or two) and I can make an entire meal on these little yummy bites. These will be perfect for when we are entertaining! So much prettier and manageable than regular fajitas. This steak is cooked beautifully and sounds delicious! The veggies would give these little bites a great texture and layers of flavors. I haven’t seen this beer yet but will have to look for it. We love all things Mexican! Such a fun idea. These are great for a party. I know how it is when you’re out all day — get home and you need to eat something NOW! That’s usually when I come up with the best stuff from whatever is leftover in the fridge. These fajita bites look mouthwatering! It doesn’t look like an appetizer to me — that looks like a full on dinner. Pass the beer and step away from the platter. BTW – that cerveza sounds perfect for our sweltering south Florida temps — but I checked, and it’s not available here. When can I get my hands on some? So simple, perfect for a party! Great simple party food, thanks! Quick and easy recipe. A crowd pleaser I am sure. Theese look like the perfect grill bites, I want to try them soon. Looks so easy to make! These fajita rolls look so good! These look so tasty, what a great idea! How cute are these! Everyone loves fajiatas and these would make the perfect party food.